For those of you who frequent browsing (exploring) the virtual world with Mozilla Firefox, so if there is no reminder, could forget the time when prayer has been entered. Among the benefits of Firefox is support Add-ons (additional functions) that there are so many. One of them is a prayer reminder. One of the add-ons that are quite useful Pray Times!, Prayer reminder for Firefox. Pray Times! 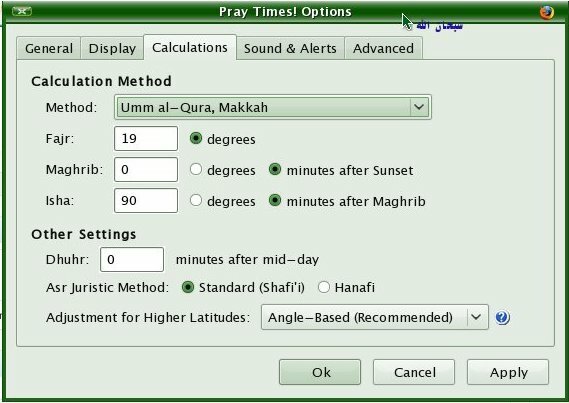 calculation algorithm using a similar (possibly the same) with a prayer reminder application, such as Shollu, Azan Times and others. So if Shollu have been using, then look almost the same time. What are the features of Pray Times! 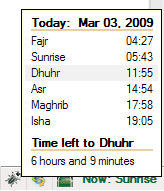 * Display information prayer time when the mouse on the area of Pray Times! 1. Go to the URL address Pray Times! 2. Click the “Add to Firefox”. 4. Just click the Install Now. See the effect so that firefox needs to be opened and closed again. If we do not want to install directly from the brower firefox (possible to install in the home, eman browser, computer, etc. ), then we can download this add-on separately. 1. Use a browser other than Firefox, for example, Chrome, IE, Safari, etc. Operas. 2. Open the link above, Pray Times! 4. Save this file on your computer. 3. Click Open, then it will continue with the installation process of Pray Times! In the right corner of the Firefox browser will look prayer time. To set, please right click and select Opstions. Azan files that are included only a sample only, so only heard the sound Takbir adzan. 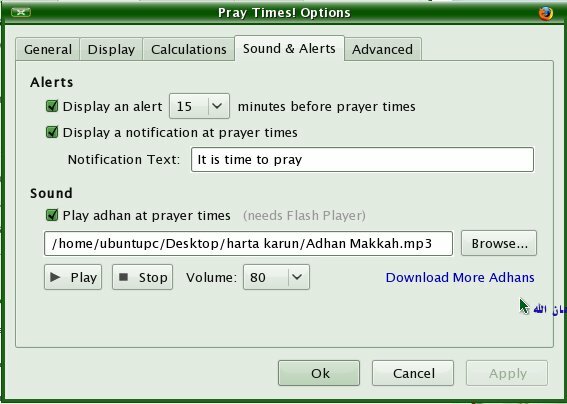 In addition to the Pray Times!, Reminders prayer for windows could use Shollu, while for handphone (HP) and other gadgets that support java, can use the Azan Times.